Place rice cakes on baking sheet. 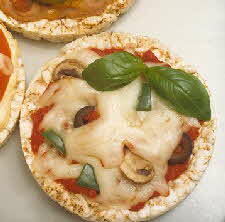 Spread pizza sauce evenly on each rice cake; top with olives, pepper, and mushrooms, and then with cheese. Bake at 400 degrees 10 minutes.